Joan Collins is an actress, best-selling author, accomplished producer, and a successful entrepreneur. Nominated for an Emmy Award and winner of a Golden Globe Award and People’s Choice Award as well as numerous other awards worldwide, Collins has appeared in more than 60 films and dozens of television programs. 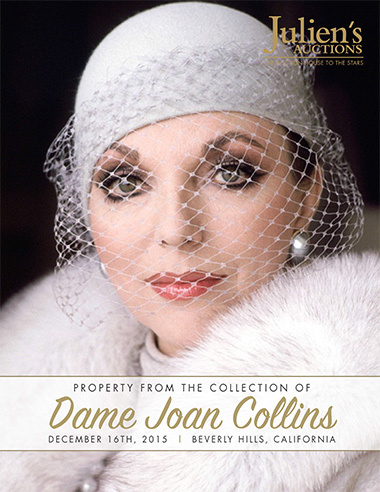 Highlights from The Collection of Dame Joan Collins include outstanding couture dresses from the 1960’s, screen worn costumes, designer fashions and accessories, jewelry, career memorabilia, decorative art, furniture and personal items. These highlights include two vintage Louis Vuitton steamer trunks, a 1961 beaded event worn couture dress, a couture halter dress worn to the “Doctor Doolittle” premiere, costumes from “Dynasty” including event worn gowns designed by Nolan Miller, a custom made white fox and mink cape designed by furrier Edward Lowell, a collection of costume jewelry dating from the 1960’s to present and a gold perfume bottle gifted to Collins from Natalie Wood and Robert Wagner. Other highlights include furnishings and many personal items. Collins is also a tireless humanitarian and patron of worldwide charities including the International Foundation for Children with Learning Disabilities, The Shooting Star Hospice and others. In 1997 Dame Joan Collins was appointed Office of the Order of the British Empire (OBE) for her services to the Dramatic Arts and Dame Commander of the Order of the British Empire (DBE) in 2015 for her services to charity. 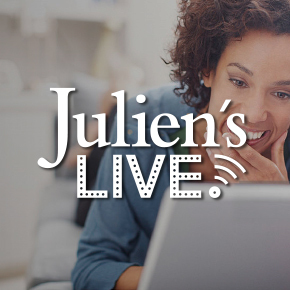 Join Julien’s Auctions for a unique opportunity to obtain a piece from the life and career of one of the most influential actresses of our time.